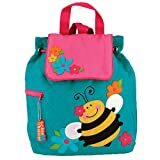 How to select kindergarten backpacks for girls? Your toddler is excited for her first day or return to school after the fun holidays are over. What better way to motivate her more than to take her shopping for school supplies, new school shoes, and new kindergarten backpack? It will be a fun bonding time with your daughter and also a great inspiration for her to go back to school if she’s not ready yet! After all, kids love having endless vacations where they could play all day long. Before you purchase the perfect kindergarten bag for her that she will treasure for years to come, make sure to not only rely on what she likes; do your research too on what to get that will not only be comfortable but also suitable for her needs. Kids would just focus on the design; they won’t bother with anything else. As a parent, it’s your duty to pick the one that best suits her. Although it doesn’t seem very important, you should play a role in the choosing process. Here we have listed some factors that you should consider when selecting the best kindergarten backpack for your child. What are the factors to consider when selecting kindergarten backpacks for girls? Size: Kids in kindergarten won’t really need a big bag because they won’t be bothered with carrying lots of books and binders. Most of their stuff to be used for school will be stored by teachers in their school lockers and if they have to take home some books for homework, it would be very minimal. This is because kids aren’t supposed to carry a lot of stuff to and fro school. They’re small and frail. Plus it’s unhealthy for their backs, shoulders, and legs to be carrying a lot of weight early on. With this in mind, purchase something small for your daughter’s backpack. Think of having enough space for one notebook and a few class items like pencils, crayons, and erasers. Zoo safety harness is a toddler backpack with a detachable child leash for the smallest travelers and pocket compartments for your child's essentials. Take off the child leash and your little one will feel like a big kid with his own toddler backpack! It comes with a tether that you can use to guide your toddler wherever she goes. It also has enough room for all the stuff mentioned above while still being small, cute, and just right for your daughter. Design: What matters most for a child is the design of her kindergarten backpack. If you can, take her with you when you go shopping for backpacks so she can choose what she likes best. This is so she will take good care and love her backpack. You don’t want to invest in something that she will be only interested in for a few months. Make sure her fascination with it lasts. Popular cartoon characters may catch the fancy of your daughter. You can arm yourself with this information if she won’t tag along with you in shopping. Popular choices for girls are the Disney Princesses, Hello Kitty, Minnie Mouse, and many more. First off, it is their favorite Hello Kitty; it has a combination of colors pleasing to their eyes (aka Pink), and has strawberries as prints. It’s definitely adorable! Pair it with a pink ribbon and your daughter is good to go. Purpose: If the main purpose of your kid’s backpack is for school, get one that will last a while. Although your child will love super cute bags, you won’t want to get one based solely on the looks. You want one that will last an entire school year or more to save you from getting bags during the middle of the school year, or every year. Also get one that you can easily wash without breaking easily. Kids are prone to get into mess, such as food stains, paints, dirt, mud, and whatnot. Also, you can get a backpack that may be used not only for school but also for travel. May be your best bet for this because of its wide compartment with adjustable mesh bottle pocket on the outside. It also has padded and adjustable comfy straps to ensure that your child wouldn’t feel tired while carrying it after long walks. Comfort: It is also important to note that above design and structure, the comfort the backpack can give is also vital. Kids will lug their backpacks all the time so you want to get something that would fit right through their small body frame, without putting too much pressure on their backs and shoulders. As previously mentioned, they aren’t supposed to be carrying a lot of weight at such an early age. Still, it is important to have something that would feel right as they have it perched on their backs. Get something that has padded straps and has soft cloth, as it would be rubbing against their sensitive skin all the time. If you can, also find something that has padded back for added support. As for the ergonomics of the backpack, pick one that has a drawstring and magnetic snap, which is perfect for little hands to open and close. Ultra-comfortable backpack that has an easy magnetic snap closure and is made of 100% cotton. This little backpack is the perfect accessory for your daughter with its quilted cotton material with super cute whimsical designs. Whatever you and your daughter pick for her back to school kindergarten backpack, make sure that it’s one that she really likes, but also one that you have approved. Although the design is important for the child, you also want something that is the right size, the right price, and provide the best comfort possible. You also want to invest in a good one so it’ll last years of use. With the right kindergarten backpack, your child will be excited to go to school every single day.